Oil palm production in Malaysia has an impact beyond the direct loss of habitat,a new study has shown. It also provides a rich food source for crop-raiding wild boars, which then multiply in big numbers and damage forest trees, preventing regeneration. Sixty-six million tonnes of palm oil are produced annually – it is the most commonly produced vegetable oil. Its low world market price and properties that lend themselves to processed foods have led the food industry to use it in half of all supermarket products, and it is also found in shampoo, cosmetics, cleanings agents, candles and toothpaste. 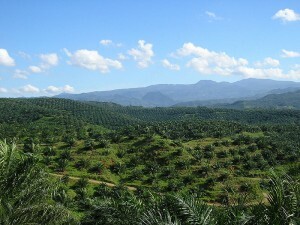 Oil palm plantations currently cover more than 27 million hectares of the Earth’s surface. But the clearing of forests to make way for these plantations occurs at the expense of biodiversity and ecosystems. Eighty-five percent of all palm oil is produced and exported from Indonesia and Malaysia, and mammals in Southeast Asia such as orangutans and tigers are suffering from the destruction of their habitat. If the current situation does not change, it is feared that orangutans could become extinct in the wild within the next 5-10 years, and Sumatran tigers in less than 3 years. According to the World Wildlife Fund, an area the equivalent size of 300 football fields of rainforest is cleared each hour to make way for palm oil production. This large-scale deforestation is pushing many species to extinction, replacing forests and human settlements with “green deserts” which contain virtually no biodiversity. Additionally, deforestation for palm oil plantations contributes significantly to climate change. The removal of native forests often involves the burning of timber and forest undergrowth, emitting huge quantities of carbon into the atmosphere. As a consequence, Indonesia – the world’s largest producer of palm oil – temporarily surpassed the United States in terms of greenhouse gas emissions in 2015. With their carbon dioxide and methane emissions, palm oil-based biofuels actually have three times the climate impact of traditional fossil fuels. A new study led by Nanyang Technological University in Singapore has warned of another threat that oil palm production poses to tropical forests – over two decades, the international team of scientists found that oil palm production in Malaysia has an impact beyond the direct loss of habitat. It also provides a rich source of food for nearby wildlife such as wild boars, which then multiply in big numbers and damage forest trees and prevent them from regenerating. Published in Nature Communications, the research paper reports that the wild boar population grew a hundred-fold in forests that were adjacent to oil palm plantations, even when the forest and plantations were over a kilometre apart. The wild boars reduced the number of small trees and saplings by more than half, compared with experimentally fenced-in areas of the forest that did not have wild boars. This reduction is primarily driven by wild boar mothers harvesting small trees to build nests for their young. Dr Matthew Luskin, a research fellow at NTU Singapore’s Asian School of the Environment, conducted this study in partnership with the Centre for Tropical Forest Science – Forest Global Earth Observatory (CTFS-ForestGEO) at the Smithsonian Tropical Research Institute and researchers at the University of California, Berkeley. The researchers said that with many oil palm plantations found near Southeast Asia’s remaining forested lowlands, it could have a similar knock-on effect on the ecology in those areas, but its long term impact warrants more in-depth studies. “I’ve personally seen population eruptions of pigs and macaque monkeys in forests near oil palms across Peninsular Malaysia, Borneo, and Sumatra. 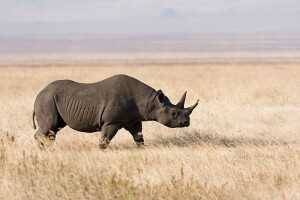 This may become a huge conservation issue for the entire region,” states Dr Luskin. 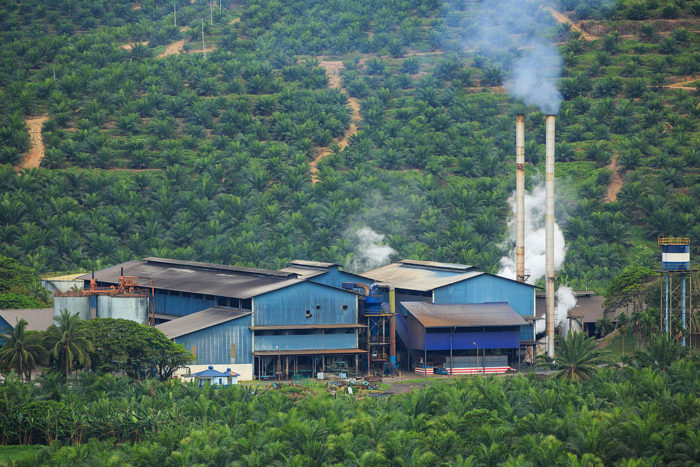 The researchers urged oil palm growers (as well as the countries and regulatory bodies that govern them) to consider ways to limit negative impacts. One solution suggested by Dr Luskin could be for forest reserves to be surrounded by larger ‘buffer’ areas to limit wildlife access to oil palm fruits. With many tropical forests lying within a kilometre of a non-forested area, such as a plantation, the scientists said well-protected forest reserves may be insufficient to conserve tropical biodiversity in the face of ongoing agricultural expansion. Efforts to control the wild boar or feral pig population is also culturally sensitive in some parts of Southeast Asia where pigs are regarded as unclean and consumption of pork is taboo. The study focused on native wild boars, which are well-known to farmers as crop-raiders. The wild boar population is estimated to grow 100-times larger than natural levels, resulting in dramatic impacts on an intact forest. Other animals such as macaque monkeys are also known to forage on oil palm and become common in forests found near plantations. These animals eat birds’ eggs and a variety of other species and also alter the food webs in forests found near oil palm plantations. Associate Professor Fidel Costa, Acting Chair of NTU’s Asian School of the Environment, said this study is yet another project that showcases the strengths of the partnership NTU Singapore has with the Smithsonian Institution in the United States. 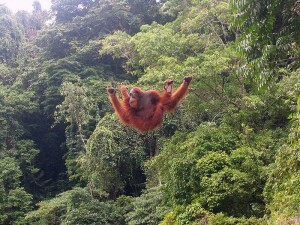 It isn’t surprising then that the estimated orangutan population is now 8% of what it was 100 years ago. 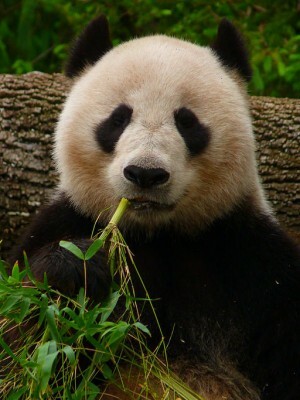 The reason why bamboo will be so seriously affected by climate change is the plant’s unusual reproductive cycle. Not only are the plants that feed them being removed for the development of plantations, but the forests are also being fragmented.